Midphase was born in 1998 when a few tech enthusiasts got together and planned to start a company where they can help the regular people and small businesses connect with their audience all over the world. Since then, it has gradually built a strong team and a solid presence in the web hosting industry. The company has offices in USA, UK, Ukraine, and India. Midphase is one of the oldest hosting providers that are still around. This is a clear indicator of their professional service. Its plans are reasonably priced and offer all the features you would expect. You get unlimited storage and bandwidth for all plans, which is quite uncommon. All these features make Midphase an excellent choice for hosting business, professional, or personal websites. You will have unlimited storage to store all the necessary website files. Your website will enjoy unlimited bandwidth to cater to all of your visitors. The built-in free domain with all plans will make it a lot easier to get started within minutes. Unlimited email accounts will help you use branded emails with your primary domain. Toll-free 24/7 customer support will come in handy to get the necessary assistance. 30-day money back guarantee so that you can get a full refund in case of any issues. Instant account activation will let you get started with your account immediately. The dedicated IP address is available for a monthly fee. Several platforms for website analytics will help you collect the necessary website data. You can use the advanced e-commerce features to launch and manage your store. Complete .htaccess editing option will enable you to have pro-level server control. The personal dashboard will provide you with a high-level overview of the account. 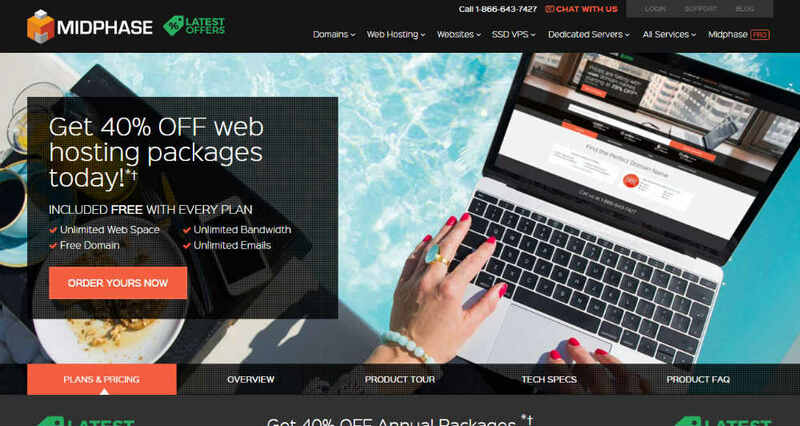 Personal Web Hosting: Priced at $4.17 per month, the Personal plan allows you to host one website, create one database, one sub-domain, unlimited web space, bandwidth, and email accounts. Professional Web Hosting: For $5.37 per month, this plan allows you to host three websites with three databases, five sub-domains, unlimited storage, bandwidth, email accounts with several other add-ons. Business Web Hosting: Priced at $6.57 per month, the Business plan includes unlimited storage, bandwidth, database, sub-domain, and email accounts. It also includes a free dedicated IP address, SSL certificate, and web analytics. All of these plans are provided with a free domain. Midphase has a specialized knowledge base that allows you to search for specific questions. The popular questions and the core products sections will provide instant answers to the commonly asked questions. For additional help, you can use the help ticket or live chat features. Monthly basis pricing starting from $2.78 to $4.38. Features varies on the plan selected.